Hi Darlings! I have been in a "clean it up or throw it out" phase and my sewing room was busting at the seams and things were everywhere so I started cleaning it up and organizing it yesterday. 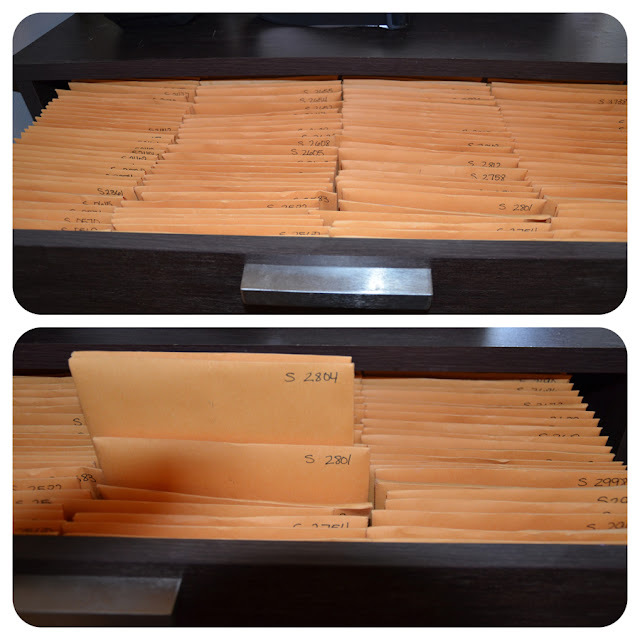 I am going to walk you through the room and how I organize certain areas. This is the corner of the room where I have my desk, TV ( which is always on while I sew) my pin board and a candle that I keep on my desk for mood and fragrance, LOL. I also have this bookshelf I bough at Ikea HERE and also purchased the doors (sold separately) HERE and it I love all the added storage space it gives me. :-( I need another dresser but for now this is fine. It also hold my elastic bin, notions, snaps, fit dye and a bunch of other crafty things. 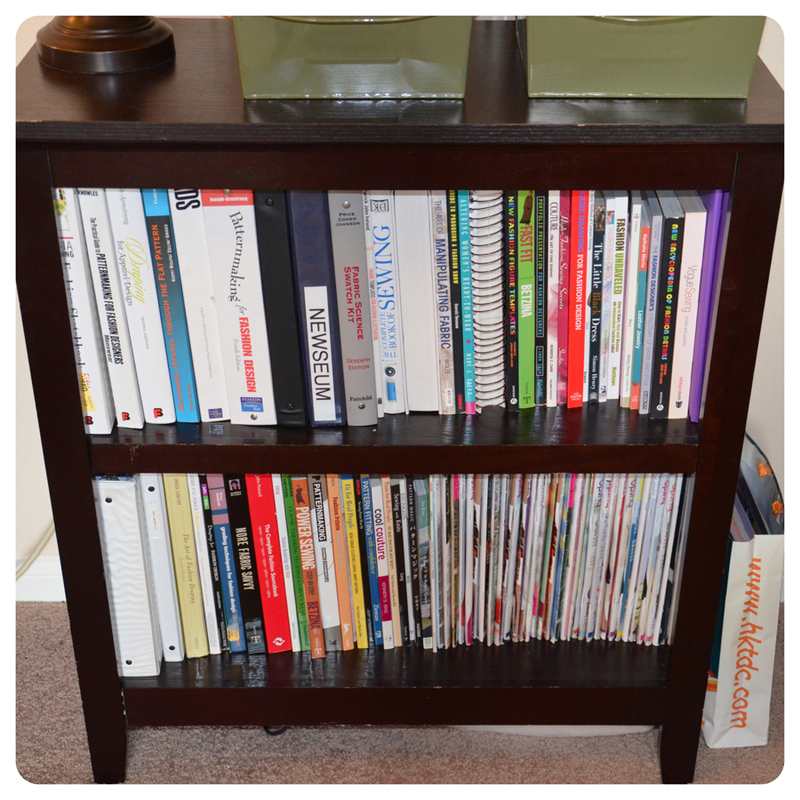 The tops shelves hold my thread bins, books I am currently reviewing/reading & my pattern binders. This is my pattern dresser. 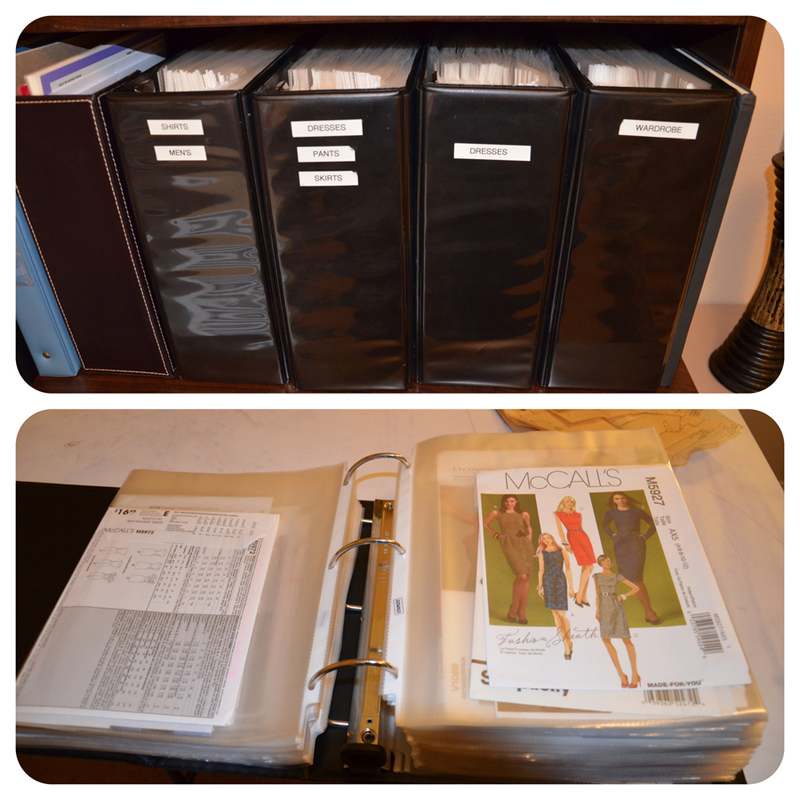 Having my pattern envelopes in binders makes it easy to sift through them, find the pattern I want to work with and then easily find it in my pattern dresser. Marking them at the corn makes them easy to look up because they are also filed numerically. My sewing table with my Bernina and Serger. The small plastic drawers hold things I need while sewing. Seam ripper, needles, chalk, seam gauge etc. 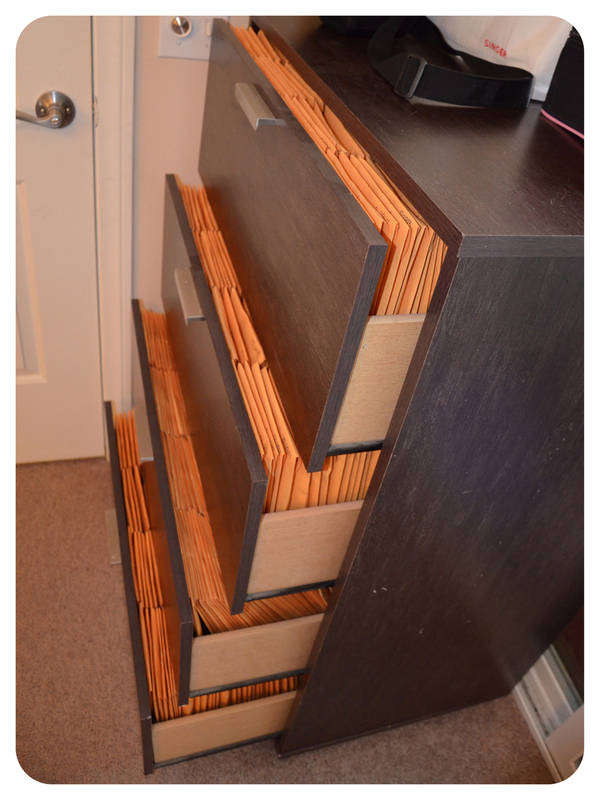 Buttons and fasteners are in the 2nd drawer, zippers are in the 3rd. This is my cutting/ironing corner. I use the cork board to hold the rulers I use during pattern drafting or altering. It hold my scissors and usually my inspiration tear sheets which I just cleaned out. 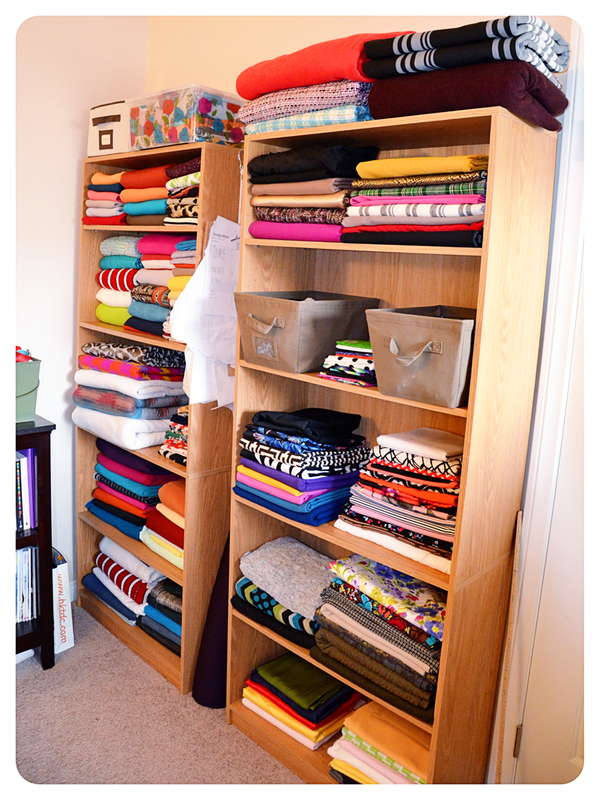 This is my fabric/bookcase corner where I store my fabric on bookshelves organized by fabric type. Knit solids/prints, bottom weights, coating/wools, chiffon's and silky fabrics are in the floral bin up top and in the brown fabric containers because they are slippery and tend to fall over. My Bookcase is where I keep most of sewing books and pattern magazines likes Burda. I often sit in front of my bookcase and read through my books until I become inspired by something. Hope this gives you ideas that you can incorporate into your sewing space. Love the idea for pattern storage Mimi! I scanned all of mine in my computer and now I can't find them lol, after too many crashes. 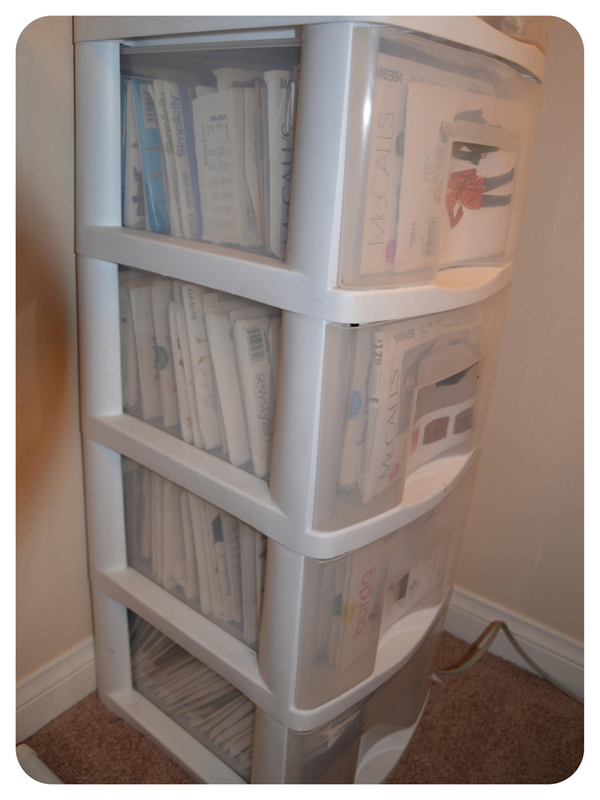 Awesome - I've been looking for ways to organize my sewing room better. My patterns and fabric are getting outta control! I really like how you have your fabric on a bookshelf. You can see them all at one time. Mine are in a bin so it's hard to see everything and I've missed out on some great fabric on projects. Where do you put your scrap fabric? Love the room! 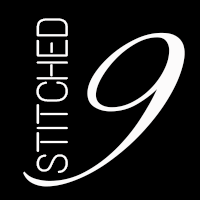 I thought I was the only one who needed to have the TV on when I sew. Have you actually made anything with that McCalls pattern that you have on display? LOL, I need noise in the background. Not sure, I may have. I use the same pattern storage system, and it works really great for me. Everything is where it should be, and I just love binders for organizing my stuff. My recipes are in binders, as well. I don't have a sewing room, but I need to do something about my thread situation. Thanks, I like the recipe binder idea. Wow, this really is a thing of beauty! 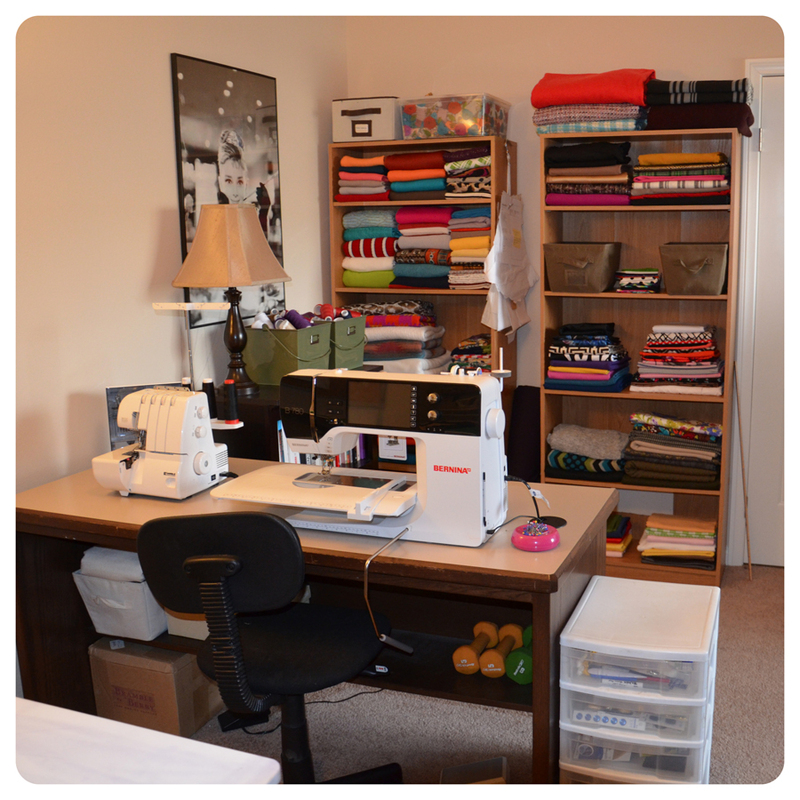 When I grow up I want a sewing room just like yours! 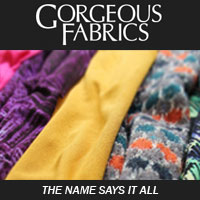 It's good to have the fabrics right on the shelves to see when you have an aha moment/inspiration. Great idea! Mimi I love your organizational skills - not just in this room but all over. 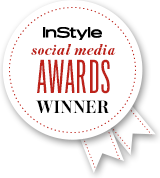 You could be an awesome organization consultant :) I know you have many hats to wear as a mother, wife, day job and fashion blogger but I just thought it would be food for thought. Mimi I have been following you for a few years now. I don't comment often but I wanted to share I saw a video of your for the envelope storage system for your patterns. 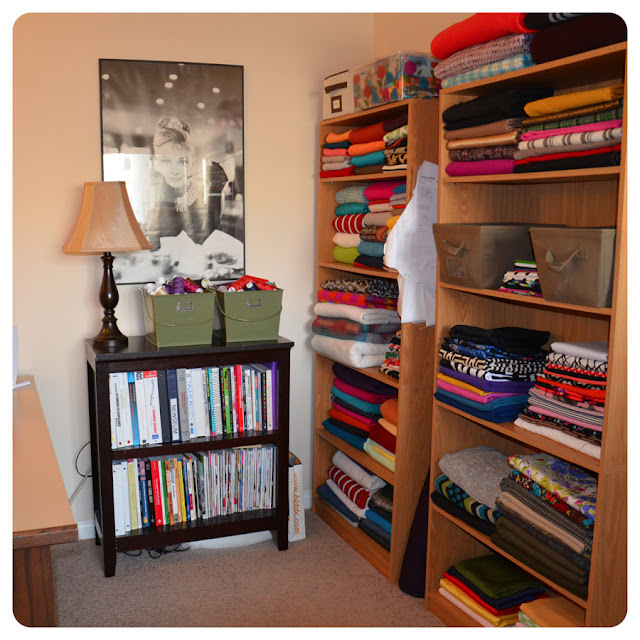 I was inspired then at make changes to my sewing space, the diva den, I recently moved into a larger home and the the method of storing patterns has lasted thru the move. Using the binders is great for research and inspiration. Thanks for sharing your awesome ideas. Nice space, really like the television And the candle idea, it would make me want to stay in my sewing room longer! 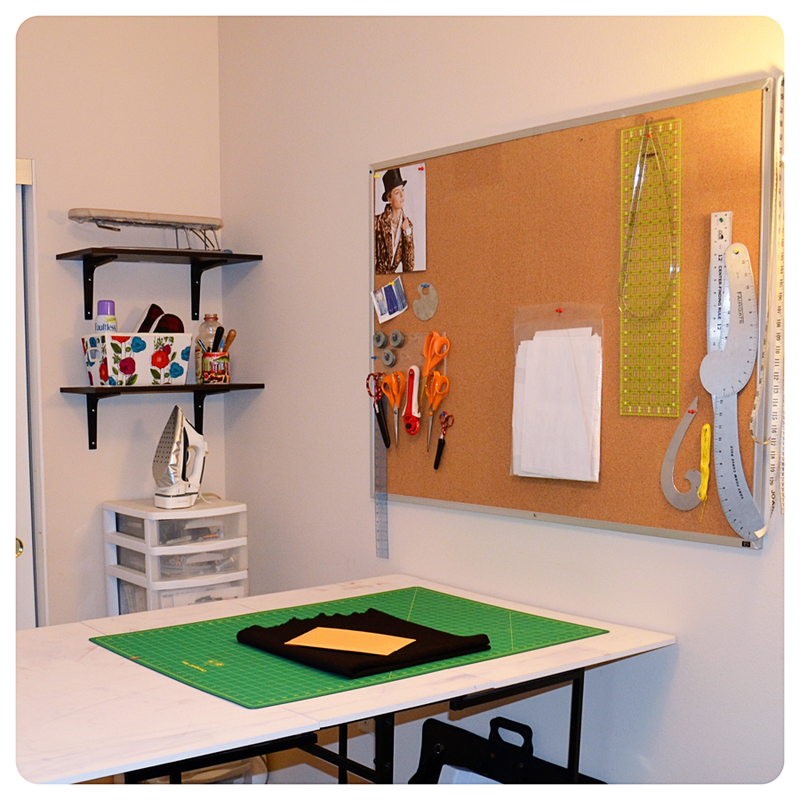 Gorgeous sewing room! Mine is in a spare bedroom that has a bed in it and it is too junky right now. I think that's what stops me from being productive. 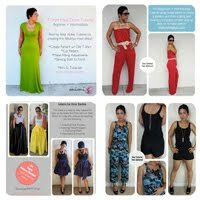 You shared some wonderful ideas thy I am definitely going to incorporate into my space. Thanks for this post. 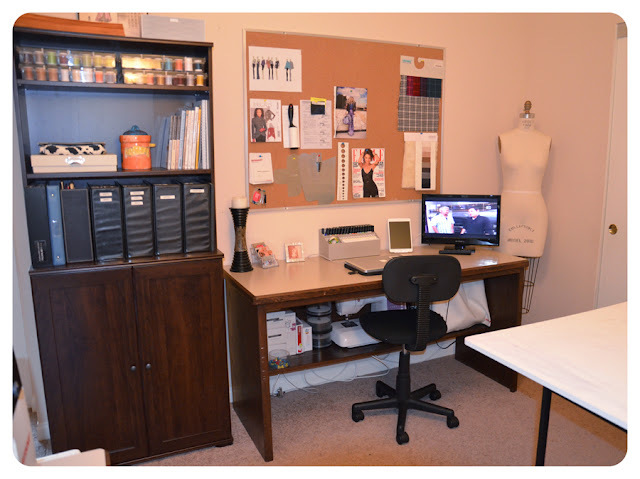 I am really inspired to get a sewing space/design studio organized like this. I love it! Thank you for the inspiration. I'm using the days between the years to clean up and move around some furniture. It helps a lot to see the spaces of other women and to get their insights on certain storing-problems. Geetings and a Happy New Year to you and your loved ones! 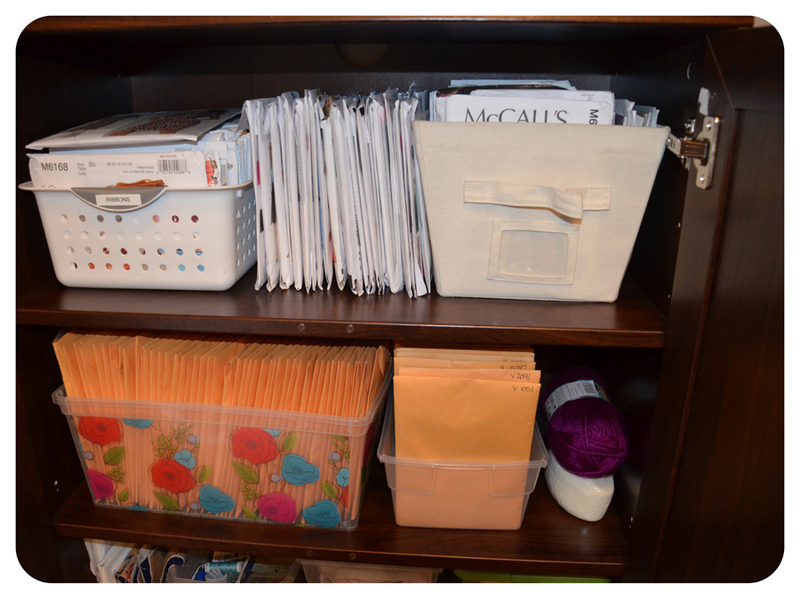 and if you do not mind I will be sharing this info and how I organized my stash on my blog.. I love your room! Thanks! I am in the process or redoing mine. I have a question.